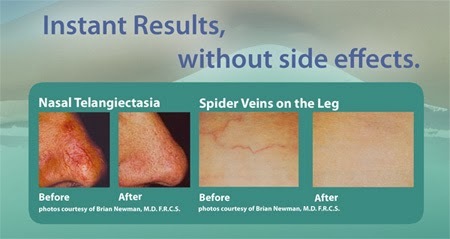 Vanish Spider Veins with Veinwave! Up until now there weren’t very many options when it came to treating spider veins. Veinwave is an innovative, FDA-approved treatment for spider veins and telangiectasia. Telangiectasia is a skin condition where capillaries are dilated, making them appear as small red or purple clusters, generally having a spidery appearance on the surface of the skin. Prior to Veinwave the span of vein treatments were restricted. The best options consisted of surgery for acute vascular conditions or microsclerotherapy for situations where surgery was not suitable. Lasers and other various procedures provided a different alternative but in some cases the results from the laser produced worse skin damage than before the procedure. Veinwave is an electrical desktop device that utilizes a needle holder and a footpedal. An ultra-fine insulated needle is inserted into the needle holder in the area for treatment. Depending on the vein, alternative techniques will be utilized but in the case of straightforward linear veins, the procedure is administered subepidermally throughout the length of the vein. The treatment is minimally invasive, only affecting the top layers of the skin and shouldn’t puncture the vessel. Veinwave is a painless alternative to laser and light-based treatments. Patients describe the feeling as a “warm pin prick” or a minor sting that does not persist. There are numerous advantages of using Veinwave over the other procedures. Veinwave produces instant results without side effects, there is no bandaging or bruising, no scarring, no hypo or hyper pigmentation and you do not need to stay out of the sun post procedure. The treatment can be performed on the face, ankles, knees, legs and other areas. Men and women receive the same results after the treatment and it can also be performed on all skin types. Patients are able to return to normal activities immediately after the procedure. Contact the Shaw Center at (480)767-1900 for more information!